When Bay State native Nick Mucci, 28, decided to launch his own company, Mucci Imports, and bring in small producer Italian wines, he imagined he'd have a few adventures along the way. But he never expected to be chased out of an inn by a burly restaurant owner wielding a salami. Mucci and his girlfriend, Kelsey, were living and working in Rome, and looking to have lunch with a wine producer in Modena. They hopped on a train and arrived at a restaurant the producer had suggested. The owner appeared displeased that they arrived after the lunch hour. "What are you doing? What are you thinking?," he bellowed, waving a whole salami above his head. It turned out he was joking with the American visitors and invited them in for what Mucci describes as one of the memorable meals of his life. The bottles of lambrusco they drank that day -- fizzy, dry reds from nearby Cantina della Volta -- were just as remarkable. Dry lambrusco wines, traditionally red, are quite popular right now. Once only associated with sweet, bubbly Italian quaffs, especially in the U.S. market, lambruschi have their artisanal counterparts. Tweets with hashtags like #ReThinkLambrusco and websites like www.LambruscoDay.org drive discussion about these unique reds, which range from frizzante (gently fizzy) to spumante (sparkling). Lambrusco describes a family of grapes that are made into food-friendly pours, bright with lip-smacking acidity, and excellent with salumi and pizza. Mucci now imports the stellar wines he tasted that day in Modena. Today, Mucci, who lived in Italy for three years and went on to get an MBA in food and wine at the University of Bologna, might be found in a wine shop talking about his bottles. Recently, at Ball Square Fine Wines in Somerville, a dozen or so 20- and 30-somethings gathered for a tasting. "How many of you have heard of lambrusco?," Mucci asks, raising the bottle with a flourish. Tasters glance around timidly; no one raises a hand. 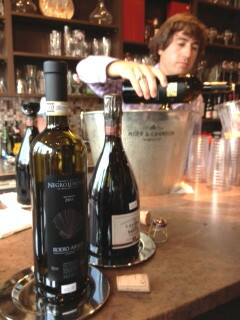 "You're going to love this," he says, pouring tastes of Cantina della Volta's Lambrusco di Modena Spumante. "Maybe you've had prosecco?," he asks, seeing people react positively to the bubbles. Lots of head-nodding. "Unlike prosecco, [this lambrusco] is made in the traditional method, the same way they make champagne." Mucci explains that there are two fermentations, the second of which creates bubbles in the bottle in which the wine will be sold. "I try to be as hands-on as possible, to make it fun," he says. "I can't put a price tag on the experiences I've had living in Italy, getting to know the people who make the wine there...I want to be an ambassador for these wines. There's so much to learn." He'll probably never have to brandish a salami to win fans. 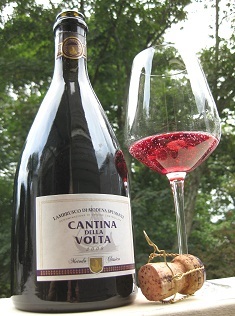 Cantina della Volta Lambrusco di Modena Spumante 2009 (Around $24) available at Ball Square Fine Wines, Somerville, 617-623-9500; American Provisions, South Boston, 617-269-6100, or go to www.mucciimports.com.